On the racetrack, Shooting To Win was a true star, winning the stallion-making G1 Caulfield Guineas in a faster time than both Lonhro and Redoute’s Choice. 18 months before the appearance of Shooting To Win’s first yearlings, one of the most astute buyers in the business, Michael Wallace, bid A$3.4 million for his dam Listen Here when she was offered at 2016 Magic Millions National Broodmare Sale in foal to fellow Darley stallion Medaglia d’Oro. Shooting To Win now has an impressive selection of 30 yearlings catalogued in January’s Magic Millions Gold Coast Yearling Sale and another 16 at the Inglis Classic Sale a month later. He has an impeccable pedigree and a physique that made him the pin-up in a stable full of stars, so there is little surprise that he and his family have already proved popular with buyers in the sales ring. For Shooting To Win’s trainer, Peter Snowden, who prepared the son of Northern Meteor in partnership with his son Paul, there was never any doubt the horse would be a star on and off the track. “He was simply a beautiful horse, a real specimen,” Snowden said. 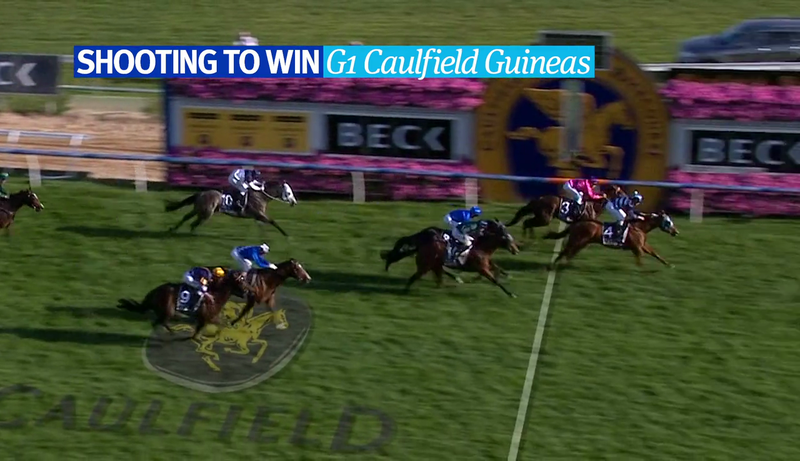 Shooting To Win arrived at the Caulfield Guineas as the second choice behind favourite Rich Enuff, but swept aside any doubt that he was the best colt of his age in Australia, flying home in the final 100 metres to win the million-dollar contest. “We could always trust his ability to shine through as it did in the Caulfield Guineas,” Snowden said. Snowden had a good gauge against which to measure Shooting To Win having previously trained Long John and fellow Darley stallion Helmet to win the race in 2013 and 2011 respectively. The colt traces back to Cotehele House, a daughter of the mighty Eight Carat and dam of G1 winners Danewin and Commands. According to Darley’s Australian Head of Sales Alastair Pulford, Shooting To Win has let down into a stunning stallion. "Anyone who sees Shooting To Win will be impressed by his physique,” Pulford said. “He is, to my mind, a commercial breeder's dream. An awesome-looking son of a great stallion who lived up to all expectations as a racehorse. Lot 651, a filly out of G3 winner and G1-placed Dane Belltar (Danewin), dam of Reset’s G1 Caulfield Cup winner Fawkner and G2 winner Tanby. Lot 113, a colt out of Listed winner Mrs Kipling (Exceed And Excel) from the family of Champion Hong Kong sprinter Fairy King Prawn, local G1 winner Easy Rocking and Listed winner Crevette. Lot 119, a colt out of My Goodness (Lonhro), a half-sister to the aforementioned trio of Fairy King Prawn, Easy Rocking and Crevette. Lot 447, a filly out of winner Witless (Stratum), a half-sister to G1 Golden Slipper winner Crystal Lily. Lot 588, a colt out of Casilda (Cape Cross), whose second dam Koniya is a half-sister to G1 winner and sire High Chaparral. For a full list of Shooting To Win's yearlings at the Magic Millions, please click here.